MoTone & Latest Article for Reverb.com! Hey everyone! I hope everyone is enjoying their summer. 🙂 I have been busy working on a variety of new projects, including some new tracks for Rayearth. However, there are two projects that I’d like to share with you today. 2018 has been amazing so far for me personally and music-wise, I feel like I’m really achieving some new ground. I have quite a few more articles to share with you all, including some very exciting news planned for Labor Day weekend so please stay tuned! Hey everyone! Hope all is well. I’ve had a really busy 2018 so far, with Winter NAMM 2018 (pix to come) and attending my third 70,000 Tons of Metal cruise but I’m happy to be in the swing of things at last. The most important update I have at the moment is that I have finally launched my new project, Rayearth. Please take a few moments to watch the video below to hear a bit more about the project and what you can do to get involved. I started writing the material for Rayearth in 2017 after dealing with some depression I was experiencing at the time. Since I didn’t have a full band, I decided to do everything myself, with the assistance of Toontrack’s EZdrummer 2 and my partner, Joey Menicucci of Valensorow. I’m still trying to take the project live so I’m looking for the right people to lend their talents to make Rayearth a reality. Anyway, be sure to follow Rayearth on Facebook, Twitter, Instagram and be on the look-out for more updates! I have always wanted to build a Warmoth instrument, especially after I started working at SF Guitarworks since so many customers brought in really cool looking builds. One day, I was browsing the Warmoth in-stock selection and found a beautiful flame maple beauty, that I immediately had to have…. Starting to look like a guitar. I opted for the EMG Pickups 81/85 set as I currently have the 57/66 set in my PRS 20th Anniversary SE Custom 24. Obviously, I had the guitar routed for a Floyd Rose, so after doing some work for my friend Eligio Tapia of Crepuscle, we actually traded some of his old ESP E-II Arrow black hardware while he upgraded it to gold hardware. Longest wait of my life. After the neck came, it was time for assembly. I started out by painting the pickup cavity with shielding paint. I decided to also paint the entire tremolo cavity with paint as well; I wanted this guitar to look really mean and gritty, and very intentional. I installed the EMGs with the solderless system, using a Switchcraft 3-blade switch. A good friend of mine from D’Addario helped me out with some Planet Waves Auto-Lock tuning machines, which were actually a breeze to install. The whole parts process was fairly straightforward. The only trouble I had during the build was the jack mounting hole was too small to fit the jack, so once again, my colleague Lewis Santer used one of his custom tools (quite literally a piece of sandpaper around a round shaped bit) to sand out the interior of this cavity. The fit of the football jack plate was almost too wide for the side of the guitar, but it thankfully wasn’t too much trouble to get into place without compromising the end result. While installing the Floyd Rose nut, I realized I somehow miscalculated the size I needed and therefore had to order the correct one. However, the new nut was still a bit too tall for the fretboard (especially after measuring with a digital nut slotting gauge), so I took the height down a little bit with my old nemesis, the belt sander. This art is by Brolo on DeviantArt. For the rest of the custom parts, I got them from a variety of places. The neck joint plate you see here is a fantasy style image I found on Pinterest of a lamia creature and consequently commissioned a laser engraver on Reverb to recreate the image for me. I love how subtle details on the neck plate can change the whole personality of the back of the guitar, having done something similar with my Mermaid Strat. I also had the pleasure of meeting Matt Harami of Haramis Musical Hardware at Winter NAMM 2017, where I realized that I could get custom knobs for the guitar to match the color aesthetic. He wasn’t 100% sure he could get the desired result I wanted but I think he was being too modest – the finished result is amazing! I didn’t end up using the switch tips but I adore the knobs! The finishing touches to the instrument were a trip through the Plek and a set-up. While cleaning the fretboard, I noticed some small bits of glue leftover from when the frets were pressed in (at no fault of Warmoth, they were very minuscule), so I carefully chiseled them off. My skill with a chisel has improved immensely in the last three years since I started working on guitars so I was very proud of not taking any wood off. In the end, I had my friend Tomm help me install the strap locks and do some miscellaneous tasks here and there with the build so thank-you very much Tomm for helping me get this project completed! I may eventually add a waterslide or a custom truss-rod cover but in the meantime, I am very content with this beautiful instrument. In which I build a truss rod cover from scratch. Help, I don’t have a brand name! For my own experience and to challenge the skill set I learned at SF Guitarworks, I decided to make a Paul Reed Smith truss rod cover for my PRS 30th Anniversary SE Custom 24, Lotty. PRS is my all-time favorite guitar company, ever since I saw an Emerald Green PRS Custom 24 at Gelb Music in 2003. When I saw the 30th Anniversary models come out on Sweetwater, I knew I had to own one. The purple quilt maple was an absolute no brainer. I also decided to test out some of my repair skills on the instrument by upgrading various parts of it. First, I upgraded the stock electronics to a completely solderless EMG 81/85 system. Next, I swapped the knobs for ebony knobs and upgraded the tuners to ebony button Schallers. They didn’t fit 100% so I had to modify them, squeezing the top two onto the headstock. It was certainly an experience sanding the machines on a belt sander. However, poor Lotty was not given the PRS designation. 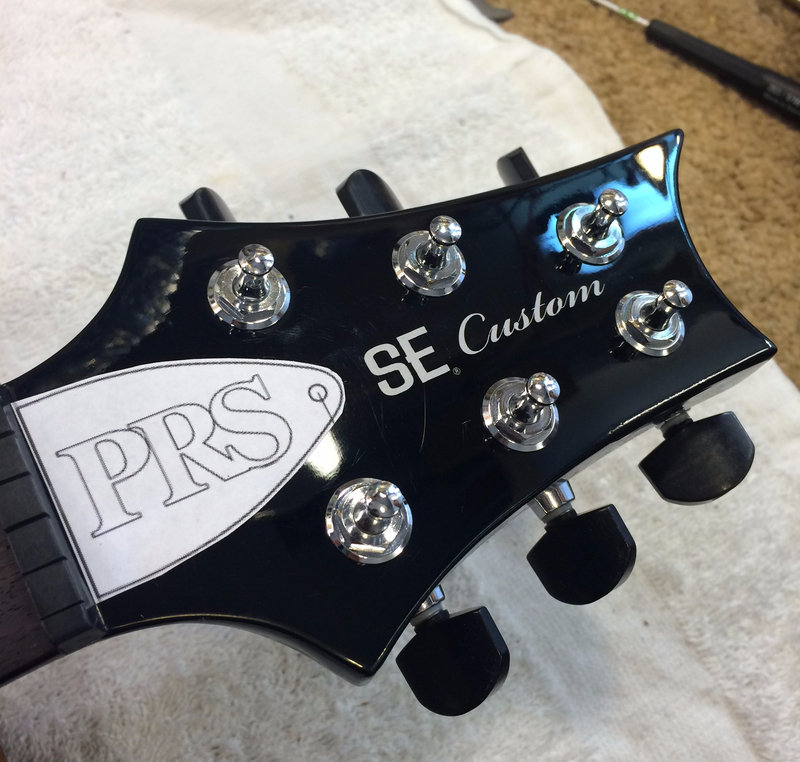 This made me sad, as I proudly rep the companies I’m passionate about, so I decided that making a truss rod cover from scratch would be the best way to honor the 30th Anniversary model. For this project, I enlisted in the help of my friend and colleague, Lewis Santer, who has considerable experience building guitars and doing inlay work. Cutting the MOP with a jewelers saw – delicate work! With the letters gently cut out, the real work began – inlaying them. Admittedly, I have only done inlay work once before: I inserted pre-made fretboard abalone dots onto my Mermaid Strat, which was tough but much easier to work with. I did two test dremel runs onto random pieces of wood, confident I could nail the very detailed letters on the first try. Nicely cut out and ready to go, after some filing. Unfortunately, I didn’t nail the dremeling of the letters. Carving the inlay by hand meant there were very tiny nuances of pearl that were hard to recreate exactly from the original tracing. Eventually, I opted for a “swimming pool” style route, which is really where my trouble began. I didn’t fill the route with enough tightly packed ebony dust, nor did I fill the route with epoxy. Nevertheless, I persisted. The result was splotchy. I couldn’t get the excess pearl dust off the top of the truss rod cover. Things started to go south. Thankfully Lewis stepped in to help me try to save the day (and what was left of my sanity at this point [thank-you Lewis]). The shaping of the truss rod cover turned out nicely. I used a variety of sandpaper, nail buffers, and elbow grease to soften/round the truss rod cover into shape. We did end up using a combination of dye and black CA to the surrounding area of the letters to match it closely to the ebony.